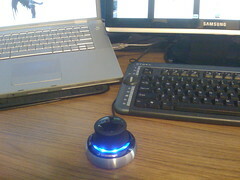 Last week my 3Dconnexion space navigator mouse arrived in the mail and I finally had an opportunity to play with it today. After a simple software install the mouse connected to my Mac without a problem, I’m running 10.5.2. I was pretty excited to try it out with Second Life so I logged in. Tried to fly…nothing happened. I tried to rez a box…nothing happened. I looked up the 3Dconnexion space navigator webpage and it said the software is only compliant with Second Life 1.20 (7). I needed to download the the release candidate, which I’m glad did (the release candidate works so much better on my machine than the current SL download). Building wise the space navigator was a bit overwhelming at first. It was amazing to watch as I was effortlessly twirling prims around on their various axis. Be sure to lock all the surrounding objects including your attached items when you first use the space navigator. If you accidently select an object you are wearing and touch the space navigator your object will get tilted, twisted or flipped pretty quickly. See the picture below. 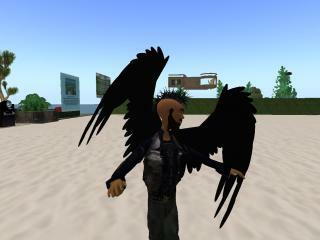 I was wearing wings while I was rotating a box and at some point I clicked my wings which then got all twisted and out of line (this will make no sense to a non SL user). The 3Dconnexion space navigator worked very well with Google Sketchup, in fact it made the tool easier to use. I’m looking forward to learning how to work with the new tool. The is a video about peer-to-peer file sharing a student of mine made in my Spring 2007 SINS course. The video is currently being used by as a training aid in an Academic Library workshop. This is a short video about the DMCA fro a student in my Spring 06 SINS Course (Social Issues in a Networked Society). In this video she interviews Georgia Harper, the copyright and fair-use scholar of higher ed right up there with Siva Vaidahyanathan and Lessig. This video lacks the amount of reflection I would have liked but i think she makes up for it with her attention to detail. The Speed dating team was able to get 2 reporters to their event, I’m not sure how they did it (or why for that matter) but I was pretty impressed with their turnout. They even went as far as sending letters to e-harmony and Match.com for sponsorship. This group had a string of bad luck hit them at the last minute as they lost their first location to a sim crash and then their backup location due to a sim sale… I’m glad they had bonded as team because it really helped them to over the last minute obstacles.